This review first appeared in the February 8, 2007 issue of the North County Times. San Diego's Nate Donnis has one of those commanding, compelling voices you can't ignore: A deep, rich baritone that sounds like a cross between Darius Rucker and Neil Diamond, with a sense of presence that holds your attention. 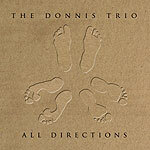 Equally compelling are the songs on his trio's first album, "All Directions." Fourteen songs in all, nearly every one a gem of melody and construction. Stylistically, the songs mostly fall somewhere between alt rock and folk (although there's a definite reggae groove to "Not Guilty," and "Gorgeous Mess" has a Latin touch). What makes them work, though, are the addictive little melodies he works into each. From the opening cut "Nothing Better Than Your Love" through the dark-tinged "No Other Place," from "A Chance With You" to the introspective "Grateful," Donnis has crafted a stellar collection of songs that are more than good enough to put him on the map nationally. He's a hit-writing machine in the making  a fully developed musical voice, the ability to turn out radio-friendly (or Internet-friendly) pop songs, a voice you can't forget. Seems pretty likely we'll be sharing him with the world in short order.